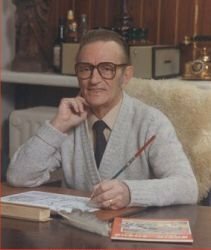 This is an introductory text which sketches the most important aspects of the history of a comic series: Suske and Wiske. Suske and Wiske is the most popular comic in Belgium and the Netherlands. Outside these countries Suske and Wiske are known as Bob & Bobette, Finn & Fiffi or even different (you can find that in the overview of foreign names). Suske and Wiske is a comic series created by Willy Vandersteen (1913-1990). He draw the story De avonturen van Suske en Wiske op het eiland Amoras (The adventures of Suske and Wiske on the isle Amoras/Amphoria). Starting in december 1945, an episode of this story appeared in the Belgian paper De nieuwe Standaard. After the story on the island, many other stories followed. And already in 1946 the first adventure was published as a book. Since it was a succes, all other stories where also published in bookform. The outside of the books has hardly changed since the very first print of The island Amoras. For over 50 years all books had a red cover with names of Suske and Wiske in white print on the top. Many book editions in other countries had this same style as well. In these 50 years some things did change, mostly on the inside. The old stories appeared, just like in the papers, without colour using just red and blue ink. In 1959 the first books were partially printed in color. That's to say every page had some colour, but it wasn't full colour. Full colour was introduced in 1967. With the start of full colour books all old stories were coloured and reedited to fit the new era. Of course collectors try to find the old stories if possible first prints and in good health. The first books in another language were published in French. Although Brazil followed very quickly. The French stories appeared for obvious reasons: half of Belgium speaks French. Up till now French translations exist. The French versions of the books were somehow different. All kinds of old stories already appeared in full colour on some of the pages whereas other pages where still without colour. French comics were usually in hardback edition, henceforth 21 of the early books appeared in hardback. French editions are not popular collectors items which makes them harder to find. In those days, the, also Belgian but French speaking, Hergé was already succesful with his Tintin. He also published a weekly magazin with the same name. Though the French edition did very well, the Flemish did awful. Therefore Willy Vandersteen, whose stories were already very popular in these days was invited to cooperate. Vandersteen did and draw some pages. This was a shock for Hergé! Willy Vandersteen was still drawing for the masses. Whereas Hergés audience was the upper class. Vandersteen had to change his style and he did, hoping to attract new audiences. Vandersteen learned a lot in that period. Especially his artwork improved. Eventually 8 stories appeared in the Tintin magazin. All these stories were printed in full colour both in the magazin and in the books. To distinguish the Tintin stories from the regular stories they got a blue cover. Henceforth the series is known as the Blue Series. Allthough Vandersteen and his successors prefer the Red Series many comic fans prefer the Blue one. For a lot of French speaking people Le fantôme Espagnol (The Spanish ghost) was the first episode of their Bob et Bobette (Suske and Wiske). Troughout the years the popularity of Suske and Wiske increases. Partially because all books have the same look, also a daily publication in the quality newspaper De Standaard, and its popular sister Het nieuwsblad help. But there are various supporting activities as well. The Flemish Television, still in its infancy shows Suske and Wiske cartoons. Karel Weyler has Suske and Wiske performances in his Pats puppet theatre. There is commercial interest as well. The GB supermarkets have beautiful show-windows inspired by the television series. Moreover a lot of companies produce various gadgets: puppets, glasses, stickers or games. Later this phenomena expands: books with special stories are packed with detergents, chocolate or what ever. Popularity of Suske and Wiske lead to derived series. Gags, that is 1 page short stories with one joke, appeared in the katholic weekly Ons Volkske. The adventures of Suske, Wiske and Lambik are also gags and appeared in the periodical of the katholic union of large families. Some books titled De grappen van Lambik (Lambiks jokes) appeared in the fifties and sixties, but since then never again. After that the stuntman Jerom got his own series and years later gags of Schanulleke, Wiske's doll appeared. The last series that belongs to this category started in February 2002. In that year a series in which Suske en Wiske appear as little kids of about 5 years old began in the magazine "Suske en Wiske weekblad". 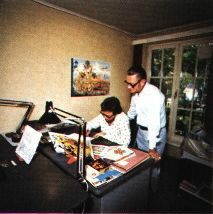 Suske and Wiske crossed the Belgian frontiers as well. Their first step of course was the Netherlands (Belgiums Northern neighbour). The Dutch liked Suske and Wiske, but they didn't like the phony Flemish way of saying things. And until 1964 different books were published. After 1964, all editions were written in a standard Dutch, which can also be read by Flemish people and no different editions appeared hereafter. Also in the 1950's stories in French appeared. Moreover there were some countries which had integral or partial copies of the Tintin-magazin and hence they got Suske and Wiske as well. After that, books appeared in allmost every Western European country as well as the USA, Brazil, Sri Lanka and Taiwan. A lot of these translations were not succesful. Sometimes, this is due to the fact that the stories were to Flemish or Dutch. But also the foreign publishers were most of the time starting companies and never big settled ones. Today the only continuing series are the Dutch and French languaged ones. Willy Vandersteen kept working. His creativity was used in starting new series time and again. And there was a lot of demand on him. The Ons Volkske magazin had to be filled and later on there was enormous request for Wastl (The derived series of Jerom) and Bessy (A serie about a dog similar to Lassie) stories in Germany. Although Vandersteen was a hard working man, he could never satisfy this demand on his own. So he started to get assistents and finally a complete studio was working on stories. The usual practice was that Vandersteen started some series with a couple of stories, and after that some assistent would take over the series and continue it. Most of the time the assistent was first trained by working out sketches or do the redrawel in ink. In the mean time Paul Geerts, starting at booknummer 135 created more stories than his master Willy Vandersteen. In 1990 Willy Vandersteen died. In conformity with Vandersteens wishes Paul Geerts still writes and draws new stories. Nowadays a new assistent Marc Verhaegen helps him drawing and writing, sometimes he is allowed to make a complete story on his own. More information in English is hardly available. You can look very hard on the internet, but you will not find that much. Most material is available in Dutch and some in French. Since the French versions of the series are far less popular, there is less information as well. Other languaged information is really scarce. In French the most important reference is most likely the translation of the biography by Peter van Hooydonck. I have read one issue of Le cahier de la B.D. about Vandersteen, I have no idea whether there is more. Dutch languaged information can be found in the specialised magazines like Versus and De Tuftuf club. Now and then Brabant Strip Magazine publishes nice stories. The effort of Stripschrift is disappointing. There are some books as well. The Ik vier het elke dag ... book is available in the libary of congress in the USA. The Peter van Hooydonck Biografie is the most complete and up to date book available.